� Williams has advanced to an AVP semifinal with five of the seven partners with whom he has played multiple tournaments with. � In the season opener in 2006, Williams and Nick Lucena eliminated Phil Dalhausser and Todd Rogers, giving them a ninth-place finish, their worst ever domestic finish. 2008: Started the season playing with Aaron Wachtfogel, placing third in their second event together. Then he teamed with Stein Metzger, advancing to the semifinals in their first two events, including one championship. In Boulder in their fifth event together, the duo went undefeated in capturing the first career title for Williams. They played in two more semifinals during the season, and Williams was ninth in the individual event to conclude the year, and he was also ranked ninth on the year in season points. He was second on the tour in blocks per game (2.05) as well as hitting percentage (.458). On the FIVB Tour, the duo played seven events, finishing ninth five times before their last tournament, winning a silver in the Klagenfurt Grand Slam. 2007: Formed a partnership with Casey Jennings in the first half of the season, advancing to the Final Four twice. Then Williams reunited with Lucena for the second half of the year. They had a best of third, and placed fifth in Manhattan Beach. Williams was the 13th-ranked player on tour, and was fourth in blocks per game (1.87). 2006: Played in five tournaments with five different partners, with a best of seventh with Nick Lucena. 2005: Williams paired with Scott Wong, and placed 17th in their first event together, requiring them to play in the qualifier in the next tournament. That event, in Tempe, saw them win three qualifying matches and finish third, which is tied for the best finish by a qualifier on the AVP Tour. In the three-day tournament, the pair played 11 matches. The duo closed the season with another third place finish, and Williams ended as the 17th-ranked player on tour. 2004: Played twice on the AVP Tour, including one time with Prosser. Internationally, Williams and Prosser posted three fifths en route to qualifying for the Athens Olympics. In Athens the duo made it to the bronze medal match, losing to the fifth-seeded team 15-13 in the third set. 2003: Played three AVP events with three different partners. On the FIVB Tour, he represented his native Australia, playing with Julien Prosser in 10 events, with a best of third in Stavanger, Norway. 2002: Played the season with Rosenthal, getting a best of seventh place two times. Williams ended the year ranked 17th in season points. 2001: After graduating, played in five events with four different partners, with a best of fifth with Sean Rosenthal. 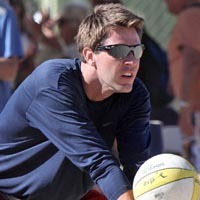 1998: Made his pro beach volleyball debut in Hermosa Beach with Larry Witt the summer after his freshman season at UCLA. Hot Winter Nights: In 2008, Williams played in three Hot Winter Nights events, winning in Oklahoma City and Kansas City. In 2009 he also played in three HWN stops, winning in St. Louis. Indoor Volleyball: In the summer 1999, while he was still at UCLA, Williams trained with the Australian national indoor team. After switching from outside hitter to libero, he made the Olympic squad, which placed eighth in the Sydney Games. College: Williams was an outside hitter for four seasons at UCLA (1998-2001). A 2001 first-team All-American, Williams played on the Bruins 1998 and 2000 NCAA championship volleyball teams and he set a UCLA single-season ace mark (63) in 2000. Personal: Williams was born in Australia, then moved with his family to the U.S. when he was nine. A four-year volleyball letterman at University High in West Los Angeles, he earned All-American honors as a member of the 1996 Junior Olympic Team. Williams earned his AAA beach volleyball rating in the summer of 1996. He was introduced to volleyball by his brother Raoul, who also played for University High.